The members of OSRAA would like to extend an invitation to you to participate in our bi-annual conference as a vendor. – Introduction of their business, apprx. 3 min. 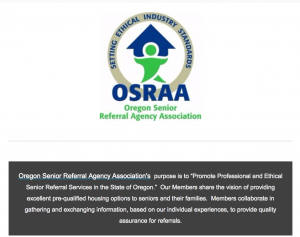 Please RSVP via the OSRAA website: OSRAA.com and call Cherie Henry, 503-970-1032 with any questions. Issue Payment to OSRAA and send to Jennifer Cook-Buman per the instructions on the RSVP form.